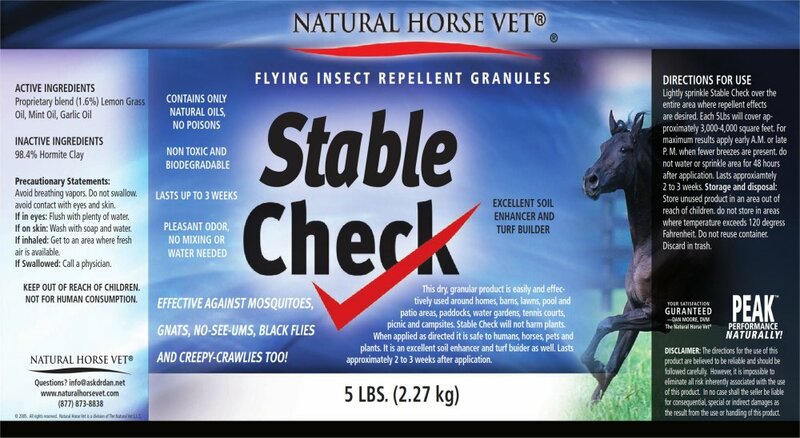 Our Stable Check formula contains only natural oils - no poisons! Non-toxic and is biodegradable. No chemicals! Lasts up to 3 weeks, even outside. Pleasant odor, no mixing or water needed. This dry, granular product is easily and effectively used around homes, barns, lawns, pool and patio areas, paddocks, water gardens, tennis courts, picnics and campsites. When applied as directed it is safe to humans, horses, pets and plants. An excellent soil enhancer and turf builder as well. 5 ponds will cover 3000-4000 square feet. 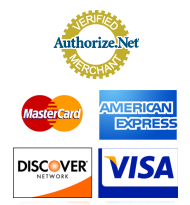 "Stable Check is great for the barn and even around the house and garden!" 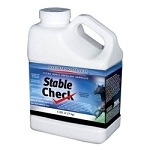 Stable Check (5 Pound) 2-Pack $10.00 Savings!